There are lots of reasons to celebrate today, despite the rain and pervasive mugginess. We moved to Katonah from NYC exactly one year ago today, and I finally feel like we are really HERE. Transitions are always awkward and growing pains are par for the course, but we all are very happy that we took the plunge, took the risk to try something new, to change. Writopia in Westchester is finally taking off with a robust summer program that starts next week, the rollercoaster expectations of myself as a debut author have diminished, and the kids are looking back on their first school year in the 'burbs with happiness and gratitude. 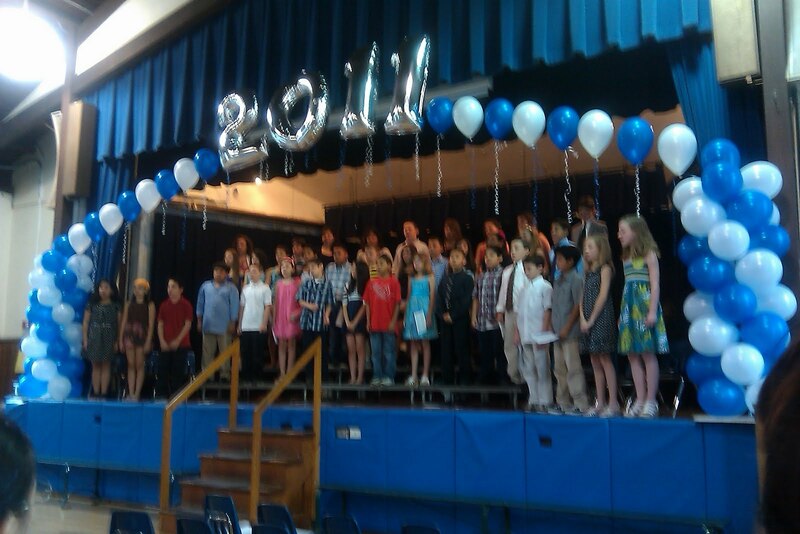 We celebrate the beginning of summer and the end of school, the end of elementary school for fifth graders. My own fifth grader, Cooper, had his MOVING UP ceremony from Bedford Hills Elementary School this morning. I was surprised by how verklimpt I got: eyes stinging, nose burning, thinking about him and all of the transitions and strides he's made throughout the years. The kids marched into the auditorium to the tune of Pomp and Circumstance, sang songs, won awards, got diplomas: and what killed the parents was the slide show of the kids throughout the years that some folks put together, along with a soundtrack that had even the most stoic of us blinking rapidly. Even though this had been Cooper's first and only year at the school, it was amazing to see pictures of his friends as they had grown up through kindergarten: in my mind's eye I also saw Cooper in his various stages in NYC. These wonderful young men and women will all go on to Middle School next year at Fox Lane, and I am amazed by how well their teachers and the school have prepared them for this transition. Tonight his grandmother is coming to take us all out for a graduation dinner at Café of Love, where he wants to celebrate not only his moving on and up from elementary school, but our year of moving on and up from the city to Westchester. At the end of the day, moving on is less of an awkward transition and more of a celebration - appreciating the past and embracing the future. Speaking of future . . . have you entered my contest yet? Chance to win one of two audio books of Edges and a signed hard copy! Check it out! so you can spell verklempt! i love it! That "nice" comment was brought to you by Cooper!